Some prime expectations from a good rickshaw or taxi meter are sturdiness, scratch-free, weather-proof make-up, accurate computing of distance and charges, not being affected by vibrations or disturbances and clear display. All of these expectations are features in Sansui taxi meters. Japanese technology has been used to manufacture these and these meters give accurate readings without being tampered by potholes on the road or weather changes. These have been passed by Regional Transport Authorities and thus are reliable. They have buzzer beep indicators, heat and oil resistant body and top class electronic components. These meters not only withstand but directly work on output voltages of the dynamo coil of a rickshaw which gives voltage ranging from 8 volts to 100 volts depending upon the throttle speed. These meters have three separate windows indicating fare, waiting time and distance travelled. These also have real time clocks. Various tariff parameters can be programmed in the meter, using programming key. 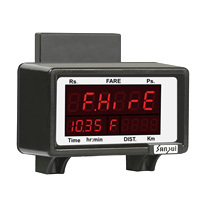 These taximeters are available in various models and types and sizes and all of them provide the same accuracy and convenience. The GPS GSM meters are a combination of electronic fare meter and a GPS tracking unit that uses the Global Positioning System to determine the precise location of a vehicle to which it is attached and to record the position of the asset. Recorded data can be transmitted through inbuilt unit.These meters are easy to install and operate, are an economical option for radio cabs and autos. They provide a bright display, have RTC for time calculation, panic button for passenger, tamper proof safe design and GPRS signal strength/connection indicator. It has easy keys, sufficient memory, battery back-up and battery life indicator.